Kora Bellisimo Balls: A surprisingly good failure! 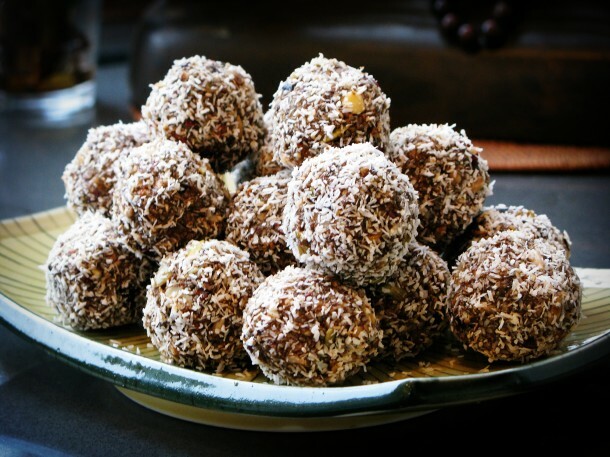 I recently stumbled upon the recipe for these Bellisimo Balls on Miranda Kerr's Kora Blog. Given that I have pretty much quit sugar (with the exception of fruit), the ingredients sounded good and ticked boxes. The recipe Author (and "Clinical Nutritionist"), Sally Joseph also has a fantastic website and blog. Sally says: "Packed with healthy plant protein, thanks to the nuts and seeds, they are a good source of healthy fats with the coconut oil and tahini, that won’t end up on your hips! My favourite ingredient – raw cocoa powder and nibs – provides a rich source of magnesium and antioxidants, as well a delicious chocolatey flavour." 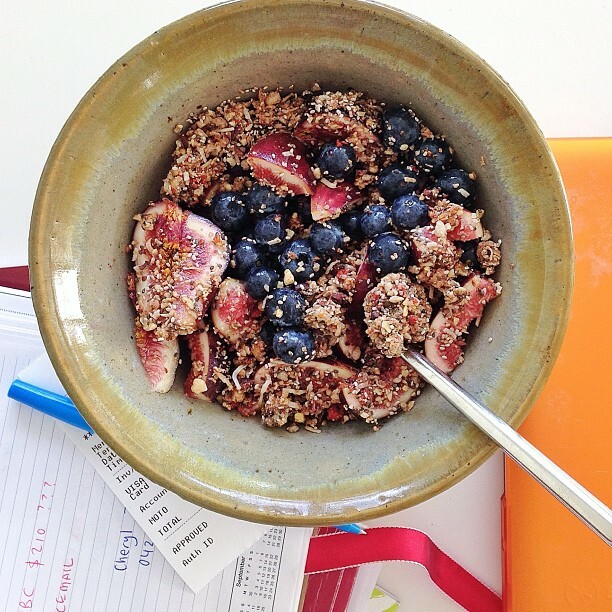 (above) I ended up storing the crumbly Bellisimo mixture in a tupperware in the freezer and I am thoroughly enjoying it spooned over fruit for an after dinner snack or even for the occasional breakfast (shown above with Fresh figs and blueberries)! 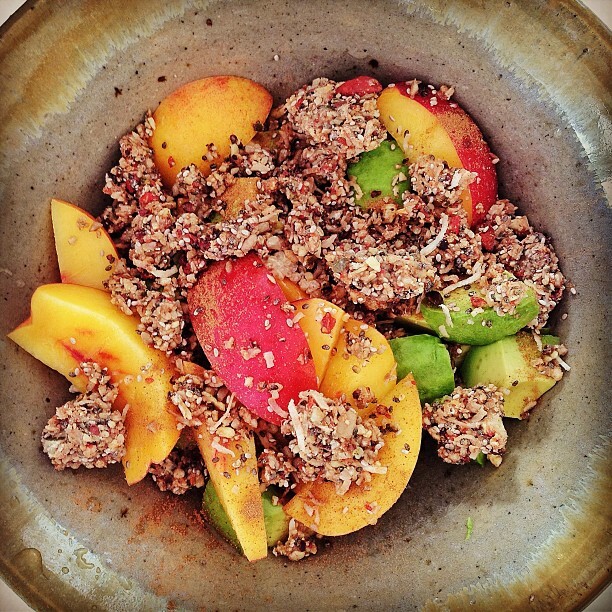 (above) Bellisimo "Crumble" with Nectarine, avocado and lime juice. 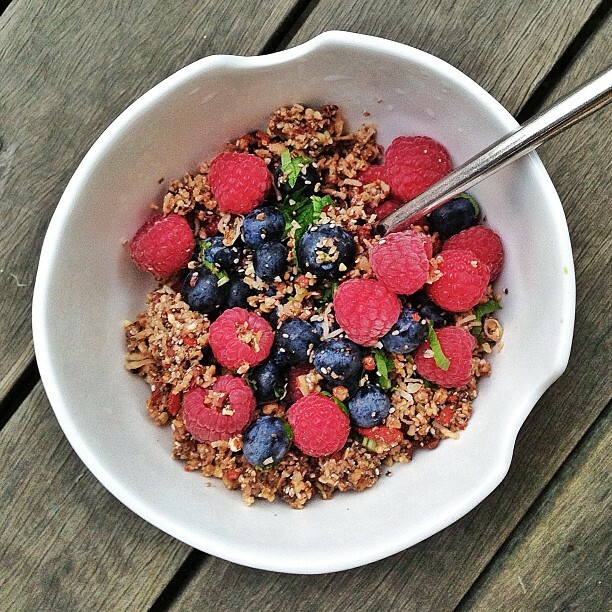 (above) Bellisimo "Crumble" with Fresh berries and Mint. Even if I COULD get these to stick together, I think I would continue using it as a crumbly topping rather than balls. Try it and see (who said failure was a bad thing!). A few TT tips: The first time I made them, I used the cacao nibs, the second time I simply left them out (without substituting anything). As someone who likes (but wouldn't die for) chocolate, I think I prefer them without - they still have cacao powder, so the hint of chocolate is still there. Also, I didn't use the green powder in them, just the rice malt syrup. Click for the Bellisimo Balls recipe. Heya! I'm at work surfing around your blog from my new iphone 4! Just wanted to say I love reading through your blog and look forward to all your posts! Carry on the outstanding work! to do for unskilled people? I've been wanting to create my own blog for a while now but have been turned off because I've always assumed it required tons of work.